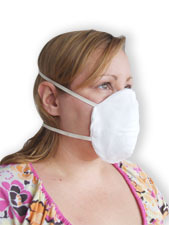 Product Description: The Dixie Cotton Allergy Mask is made of 100% cotton. The carbon insert will filter out indoor and outdoor pollutants such as cigarette smoke, soot, smog, dust, exhaust fumes, pollen, pet dander, mold and formaldehyde by 50-90%. Specifications: The Dixie mask is made of 100% bleached white muslin cotton with a cotton elastic band. The bleach used is non-toxic. Filter Media: The filter media is made of coconut shell carbon. Filter Change: The filter lasts 30-90 days, depending on environment. Store the mask in a zip lock bag or glass jar to help extend the life of the filter. Warranty: There is no warranty on this product unless it is defective upon arrival. Return Policy: Due to hygiene concerns this mask cannot be returned under any circumstances. Additional Info: The mask is machine washable, but you need to remove carbon insert before washing. Let the mask air dry. DO NOT put in the dryer. Be sure the mask is completely dry before sealing in a zip lock bag or jar.